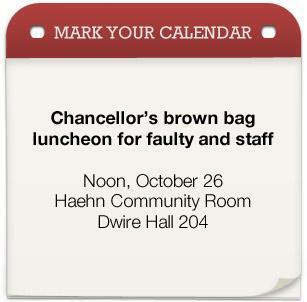 Chancellor Pam Shockley-Zalabak will host a brown bag luncheon for faculty and staff beginning at noon Oct. 26 in Dwire Hall 204, the Haehn Community Room. The lunch offers an opportunity for faculty and staff to ask questions in an informal manner. Beverages, cookies and fruit will be provided. To attend, please respond to exec1@uccs.edu by Oct. 21. From 2:30 p.m. to 3:30 p.m. Oct. 20 in UC 302, Shockley-Zalabak will host a conversation with students. She will provide a brief overview of current campus issues followed by an open session where students can ask questions.